New York is known for its breadth in variety of international cuisines. Your tastebuds can traverse the world within its five boroughs. Here are some of our favorite choices for August from modern Italian to contemporary Indian to an immersive dinner experience that will leave you in awe. Zaika New York is serving authentic Indian flavors that will take your taste buds on a culinary journey. 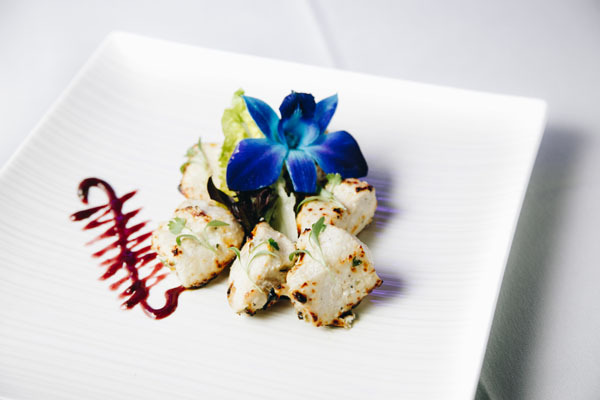 World-renowned Chef Raamanuj has created a contemporary and healthier take on classic Indian cuisine. 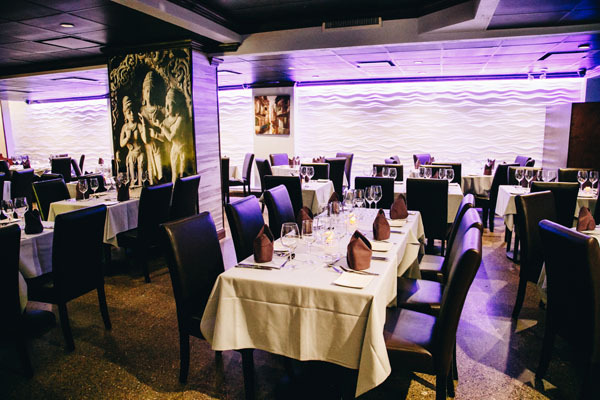 Located in Midtown at 230 E 44th Street, Zaika is providing guests a serene atmosphere with flowing designs on the walls that are meant to remind guests of the ocean as they indulge on the divine flavors of Indian cuisine. The restaurant is cozy yet intimate, making it the perfect place for both large and small parties; Zaika can seat up to 150 guests. Zaika accommodates all dietary restrictions such as vegetarian, vegan and gluten-free. The entrees are divided into vegetarian and non-vegetarian, making it easy for guests to read the menu. For those who prefer a more curated menu, Chef Raamanuj offers a three to five-course tasting menu. They specialize putting a contemporary twist on classic dishes such as tawa scallops with a saffron chili and chutney sauce, crab with tomato masala, and serve authentic favorites like butter chicken, lamb vindaloo, tandoori king prawns, and cardamom infused lamb. The restaurant also serves a lunch buffet Monday through Friday; its menu changes daily and allows guests to enjoy all-you-can-eat dishes. Not only is Zaika creating authentic Indian food that is faithful to its root, but is also stirring up craft cocktails made with Indian-inspired spices and flavors that beautifully compliment the cuisine. 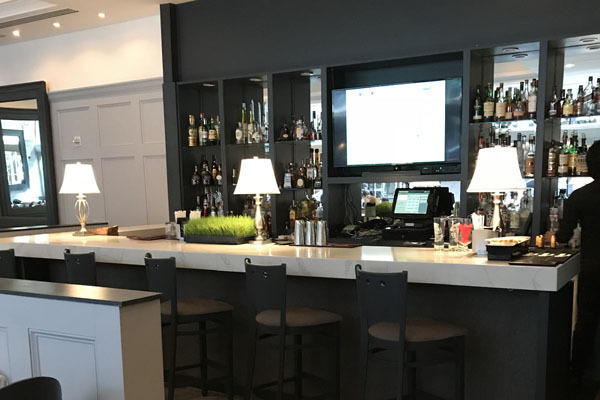 Some favorites on the bar menu include the Zaika Martini, made with passion fruit puree, citrus, vodka, simple syrup and peach schnapps and the East India Gimlet, made with gin, lime juice, muddled cucumber, fresh mint, lemon and club soda. After a three year hiatus, Bice Cucina has finally returned to New York City. The global restaurant group has been serving up classic Italian dishes since 1926. The restaurant is relaunching at 62 West 55th Street Between 5th and 6th Avenues, just around the corner from its old space. The relaunch will seat 175 guests and features an open outdoor patio for alfresco dining. The new Bice aims to appeal to a younger audience as well as its loyal patrons. Although the restaurant is creating a more relaxed atmosphere, they will still be serving old time favorites such as osso buco and veal Milanese. Bice Ristorante first came to the United States in New York City in 1987. Remo and Roberto Ruggeri, Sons of the mastermind and chef of the original Bice Ristorante, Beatrice Ruggeri, aka “Bice,” stayed true to and carried out their mother’s vision of creating an environment for friends and family to gather while enjoying authentic Italian food. Bice Cucina is the restaurant group’s fifth location in the United States and 12th worldwide. With restaurants spread across the globe in the North and South America, Europe, the Middle East as well as Asia, Bice Restaurant Group serves traditional Italian food that will transport you back to Milan, where the restaurant began 90 years ago. Be prepared for a night of wonderment at the McKittrick Hotel’s latest dinner series- The Lost Supper- A Hypnotic Dinner Party, now playing for a limited engagement through September 8. Upon entry you feel whisked back in time to the Cold War era that has a ‘Daliesque’ meets Twilight Zone feel. A bevy of enthusiastic hosts will take you on a journey to your sub conscious to a world where nothing is as it seems. This immersive surrealistic experience takes place in the Attic, a room that has only been unlocked for this series. 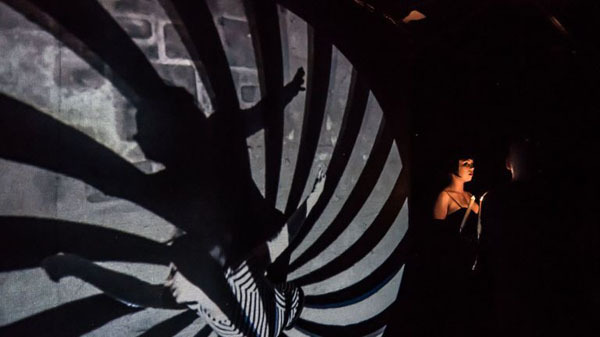 A whimsical and intriguing dinner experience, guests are treated to a 3 course dinner prepared by Executive Chef Pascal Le Seac’h with complementary wine along with one of Sleep No More’s signature seasonal cocktails. Performers will sing and entertain with surprising performances for a unique experience not found anywhere else in New York City. Performances are offered Wednesday and Thursday at 7:30 pm and Fridays and Saturdays at 6 pm and 8:30 pm. Tickets range from $175- 195 per person or you can opt for the Cloud Nine Champagne upgrade with a bottle of the hotel’s finest bubbly. 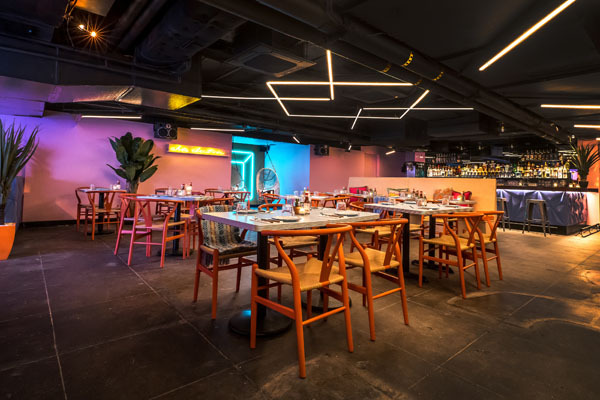 Taco Electrico is the latest underground taqueria brought to you by the Gerber Group underneath the W Hotel Union Square. The colorful and vibrant décor takes its inspiration from the creative energy stemming from the art, music, culinary, and nightlife scenes of New York City and Mexico City. The rock n roll vibe comes from the portraits of music icons such as David Bowie, Biggie Smalls, and Prince embroidered by Guadalajara artist Victoria Villasana. This energetic backdrop sets the stage for the delicious and diverse dishes created by Chef Fernando Navas. 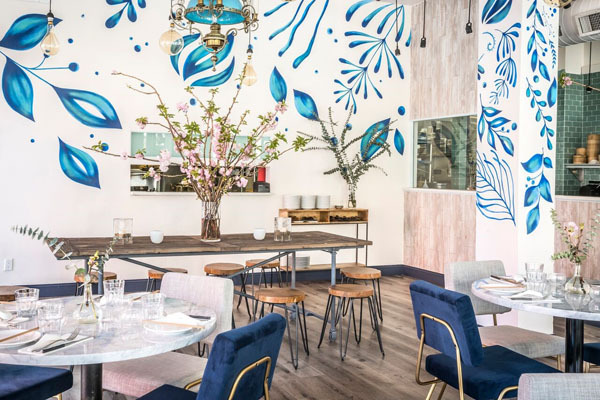 The animated 1,600 square foot space was conceptualized and designed in collaboration with Fun People that celebrates life through color with plenty of Instagrammable spots to get your culinary photo fix on. Dishes are inspired by Mexican street foods with an elevated twist that uses seasonal fare sourced from the Union Square Greenmarket. Shareable plates are divided into snacks, small bites, tacos, and desserts. The signature dishes include Esquites, sweet corn fritters with tajin, cotija cheese, chipotle mayo and lime; Carnitas de Panza, pork belly tacos with pickled red onion and epazote; Baja style fish tacos; Hamachi crudo; Chicken Tinga Empanadas, and Churros served street-style with burned sweet milk and chocolate. The potent libations center around Mexican spirits with various creative takes on the classic Margarita that venture further into the culture’s celebrated infused flavors such as fresh fruits and vegetables, herbs, spice and chili. Signature cocktails include the El Amigo Ahumado with Casamigos Mezcal, fresh calamansi and agave; Hibiscus Paloma with Casamigos Blanco, grapefruit, fresh lime and hibiscus ice; and Horchata or Nada with Casamigos Reposado infused with banana and cinnamon. One bite at Evelina BK will have you planning your next meal at this Italian bistro in Brooklyn. 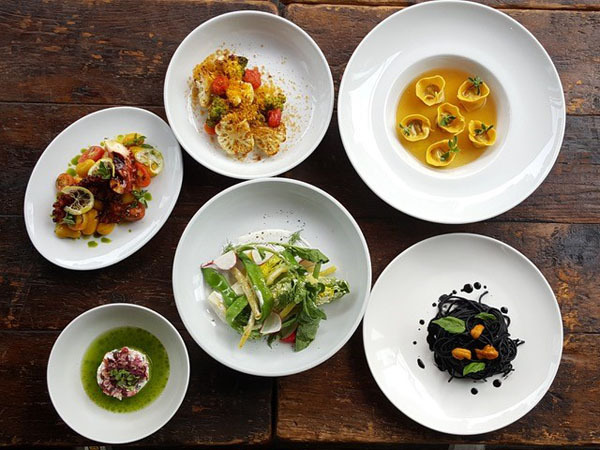 Chef Lanfranco Paliotti and his team are creating dishes that are almost too pretty to eat. Whether you sit outside and enjoy lunch at the sidewalk cafe or dine inside, Evelina BK has created a dining atmosphere in which customers can’t get enough. 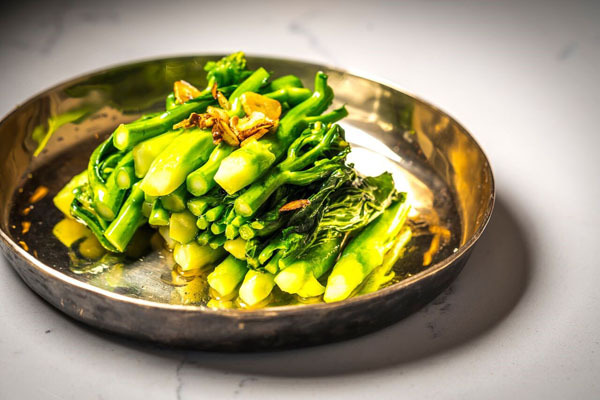 Located between Spring and Varick Streets in Soho, Spring & Varick restaurant is serving bright and colorful traditional American cuisine with a twist. This modern and chic restaurant, displaying fun pieces of art made by local artists, is serving breakfast, lunch, and dinner with fresh and seasonal ingredients that will make your mouth water. Chef Hok Chin and Chef Wei Jun Li are serving up modern Chinese cuisine with a French-inspired twist. 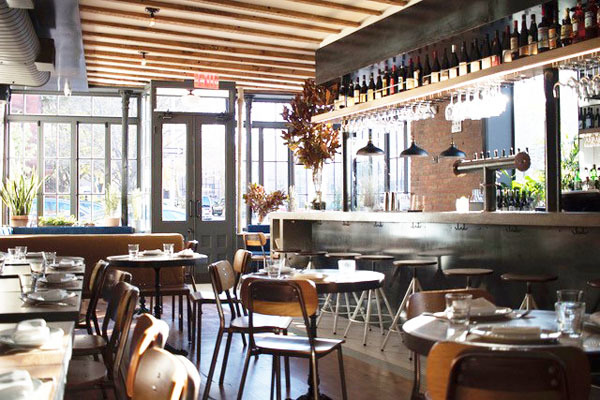 Lumos Kitchen has locations in both the East Village, as well as Greenwich Village. Lumos elegantly marries Chinese and French cuisine, mixing and matching ingredients to create a new and exciting culinary journey for your taste buds. Guests can also sip on signature cocktails and beverages made by renowned mixologist Orson Salecetti while they enjoy beautifully plated dishes. Junzi Kitchen creates traditional Chinese cuisine with a modern flair. 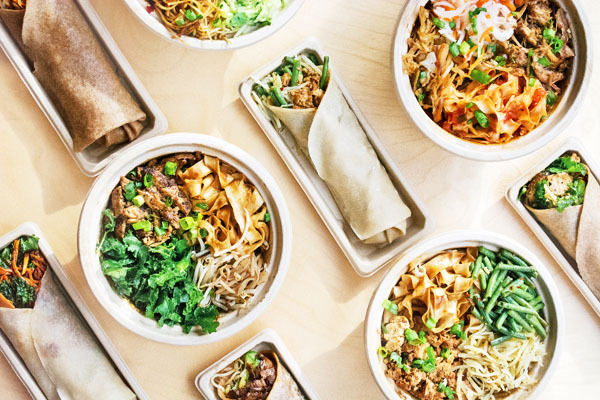 Junzi’s menu shows guests precisely what flavors and ingredients are used and allows them to build their own bings and noodle bowls. Guests can also reserve a spot at Junzi’s Chef’s Table, which takes place three nights a month and seats 18. Chef Lucas Sin creates five- to seven-course meals inspired by Chinese culture, art, and history that explores the story of Chinese cuisine beyond the regular everyday menu.